By Xah Lee. Date: 2002 . What is Expressiveness in a Computer Language? Computer languages have a solid mathematical foundation. As such tools, the more solid their technical properties, the better they are. Because they are not 100% mathematics, their validity or usefulness is partially dependent on their user. C gurus may beat Lisper wannabes but that does not mean C is a superior language. The fact that C is popular not mean C is superior. The basis of computer languages's merit lie in their mathematical properties. It is this metric, that we should use as a guide for direction. As a analogy, we measure the quality of a hammer by scientific principles: ergonomics, material, weight, hardness, construction, statistical analysis of accidents and productivity …, not by vogue or lore. If we go by feelings and preferences, hammer's future will deviate and perhaps become dildos or maces. If rubes don't recognize a computer, the problem ain't faulty technology but ignorance. If SGML hasn't made a splash but HTML did, that's a problem of social immaturity. SGML remains a superior tool. If C droids don't appreciate lisp, that's trauma of the droids, not lisp. Haskell is a purely functional language. The language of the future. I love functional languages, especially no-assignment and absolute-lazy-evaluation ones. (often known as “pure” and “non-strict” respectively.) Such so-called denotational language is a piece of computable mathematics, unerring and exacting. newLISP logo. Artist is Brian Grayless. MIT Scheme lisp logo 2010 logo. One of the best book in computer science The Structure and Interpretation of Computer Programs by Harold Abelson, Gerald Jay Sussman, Julie Sussman. 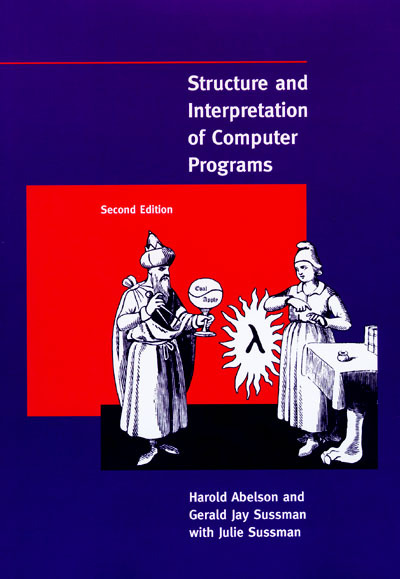 (Free online at http://mitpress.mit.edu/sicp/) The cover features a wizard talking lambda with a witch, with the foot of the table showing. Logo of Guile. Guile is a Scheme implementation. The logo of Python, inaugurated in 2006-03. The “16 ton” weight is the application icon of MacPython (deceased in 2002). The camel is the application icon for MacPerl (deceased in 2002). Perl calls for its own page. See Pathetically Elational Regex Language. The original design of the Java logo is a swirl of wispy smoke resembling a hot cup of java (above left). In 2003 June, it got simplified to a few solid strokes, to reduce the associated complexity of Java. The Java mascot is a penguin, named Duke. A Java logo designed by Xah Lee. See: Xah's Java Logo. Java is a all pent-up language with incessant lies. SQL is a query language for databases. Supposedly it stands for Structured Query Language, but that may be a fix. SQL is one of the world's most fantastically moronic language. It is a language of ad-hoc-ness; the least structured; a oneliner sequence of awkwardness and inflexibility. There are controversies regarding its pronunciation. Oracle documents would bid for “sequel”, while the venerable database guru Christopher J Date in his A Guide to SQL Standard (4th Edition) Buy at amazon dismiss “sequel” pronunciation being a myth and unfit. I have only read the first chapter of this book. This book is for expert-level developers who needs in-depth knowledge about SQL. Although there are standards for SQL the language, but it is in practice laughable as a portability practice. A excellent introductory book on SQL is The Practical SQL Handbook , by Judith S Bowman et al. Buy at amazon I read the 3rd edition in 1998.